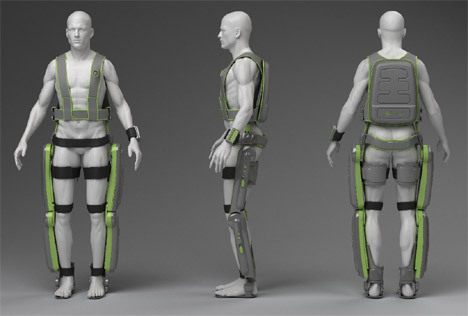 The ReWalk powered exoskeleton, created by Argo Medical Technologies, is compact enough to be worn underneath clothing. Described by Argomedtec as a "light, wearable brace support suit," the ReWalk uses DC motors at the joints, rechargeable batteries, an array of sensors and a computer-based control system to help paraplegics walk again. The ReWalk device is not a complete solution; the user will also need to use crutches or railings for balance. However, ReWalk will help integrate paraplegics or others with non-functional lower limbs back into the workforce without wheelchairs. ReWalk is explicitly differentiated from robotic powered exoskeletons like the Sarcos Exoskeleton shown in this video. According to Argomedtec, the ReWalk device uses an innovative design that "uniquely matches the user's capabilities with the control mechanisms." The earliest reference I can find to the idea of a wearable suit that would help you stand up is the atomic-powered lifting suit from The Brain Pirates a 1938 story by John W. Campbell. From Argo Medical Technology via ReWalk Exoskeleton.